A 3.3 oz bar of goat milk soap cedarwood spice. Option with a brown oval soap lift. 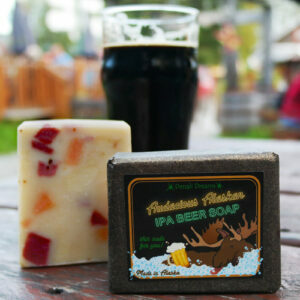 Happy goats living in Talkeetna just up the road from Anchorage provide fresh milk for these special moisturizing soaps. Milk has long been known as a skin softener and when put into soaps you will experience a rich and creamy soap that your skin will love. Scented with pure essential oils of cedarwood and cinnamon. This is my favorite face soap. It leaves your skin feeling so soft and there is no residue left on the skin like other soaps. It does not melt, lasts a good long time. Denali Dreams is such a great place to buy handmade soaps. I have been a customer for a few years now and wouldn’t change our soap preferences for anything. My husband uses Denali Dreams soaps too. The most awesome soaps ever, completely obsessed and now have become an official “soap snob”, willnot use anything but these soaps! Haven’t found a bad one yet! Discovered them on a trip to Alaska and I am a fan and customer for as long as this company exist ! !